Lady Gaga is recognized for her flamboyant, diverse and eccentric contributions to the music industry through her fashion, performances and music videos. Her achievements include 5 Grammy Awards and 13 MTV Video Music Awards. Familiarize yourself with the following cultural/contextual notes to help you understand the clip better. Read the following statements before watching the clip. Then select those that are correct. Vocabulary: Match the following entries with their definitions. 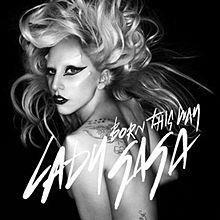 Born This Way is written and produced by Lady Gaga and Jeppe Laursen. Inspired by the 1990s empowering music for women and the gay community, Gaga explained that Born This Way is her freedom song – it is meant to be a song about revolution, freedom and lack of prejudice. Having lived like an outcast and as a victim of bullying when she was young, Gaga hopes this song helps young people to be ‘themselves’. Before listening to the song, familiarize yourself with the cultural information and contextual phrases or vocabulary listed below. Listen to the song on http://youtu.be/xl0N7JM3wZk or http://youtu.be/2E8MhqiyLTA and answer the following questions according to the song lyrics (you may select more than one option in each question).